Some years ago, while researching the history of St Paul’s Church in Birmingham, I was searching in the Birmingham Library Archives for documents about St Paul’s Church. 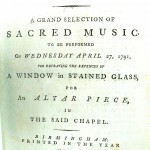 In a Library list I came across “Birmingham Musical Festival. St Paul’s Chapel For defraying the expenses of a window for an altar piece in the said chapel ( Two programmes , Apr 27,28,1791) duo. 1791.” It turned out to be a small book which had bound in it two 8 page concert programmes and a small piece on the “Form of Consecration of St Paul’s Chapel”. The concert programmes were a bit stained and, being in a hurry, I snapped them for later study. 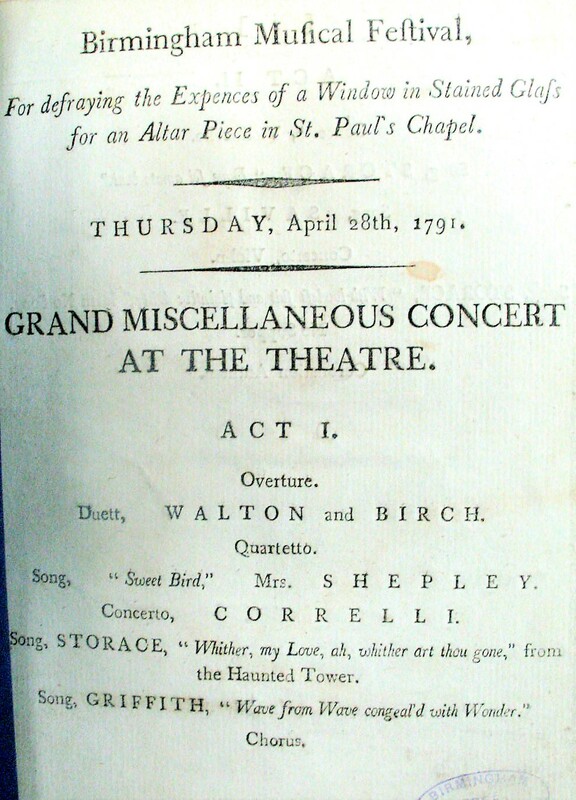 So it later emerged that one programme was for a concert on Wednesday April 27th 1791 to be held at St Paul’s Chapel, as the Church was then named, and was of sacred music, frontispiece Fig1, whereas the other programme was for a concert on Thursday 28th April 1791 at the Theatre and was “miscellaneous” music, frontispiece Fig 2. In the programmes no times were given, no prices, just the words of the pieces to be sung and the names of the soloists. Among the soloists in both concerts was one Signora Storace. Intrigued by this name, I made enquiries and was informed that this was the professional name of Nancy Storace, an English soprano, whose main claim to fame seemed to be that she sang the role of Susanna at the first night of Mozart’s “ The Marriage of Figaro” in Vienna on 1st of May 1786”. What an achievement and yet later she had sung at St Paul’s Chapel. I could not understand it, but did not follow it up, until now. In recent times her name has really been revived, firstly through the publication of Jane Glover’s “Mozart’s Women” and then in 2017 by the publication in France of Emmanuelle Pesque’s book “Nancy Storace–muse de Mozart et de Haydn” On February 4th 2018 Ex Cathedra, with the CBSO, held a concert in Symphony Hall, Birmingham, based on “Mozart’s Women” and it included a piece written by Mozart for Nancy Storace. As recently as March 7th Bampton Classical Opera held a concert at St John’s Smith Square in London on “Songs for Nancy”. The two names are known and they were probably the only other professional singers. Emmanuelle Pesque has confirmed that the dates shown here are incorrect and that the April dates stand. I had found that some key parts of the story were covered by J A Langford in his book “A Century of Birmingham Life or A Chronicle of Local Events” published in 1870 and they will be used here.The story really starts in 1785 when the records show that St Paul’s Vestry announced on March 9th that they were commissioning an “Altar-Piece consisting of a Window of Stained Glass to be executed by Mr Francis Eginton from a design by Mr B West on the Subject of the Conversion of St Paul” They also “Resolved that Mr F Eginton be requested to procure the Assistance of Mr Wyatt to inspect the Architecture of the said Altar-piece”. And finally they “Resolved that a Subscription be entered into and forwarded to raise the Money to defray the necessary Expences…”. At this point St Paul’s Chapel would have had a simple wooden altar, with probably only a Crucifix on it, and a large window of plain glass behind it. Inside this window a new window was to be built, as an Altar-Piece. Furthermore, Eginton would not be using conventional coloured glass, but painted glass, that is painting on glass and then firing it to produce a type of adherent enamel, the best way to reproduce a painting. They were to use the Venetian style, a main window and a smaller one each side. It is little wonder that Mr Wyatt, a leading architect of Birmingham, was to be consulted on this new structure. It should be mentioned here that externally the chapel looked very different from now, it was without a steeple. It was to be 1823 before a steeple was built. Benjamin West painted his designs for three windows on the subject “The Conversion of St Paul” and over a period sent them to Francis Eginton who copied them for his work and returned them to West. St Paul’s Chapel did not buy the paintings but rented them at a cost that has been thought to be 80 Guineas. I cannot find any quotation by Eginton. On March 28th1791 there followed another announcement…..” It is with great pleasure we can now with certainty announce to the patrons of the Arts, and to the public in general, that the much admired window of stained glass, representing the Conversion of St Paul (executed by Mr. Francis Egginton,of Handsworth, near this place) and intended for St Paul’s Chapel, will be opened in the ensuing Easter Week, on which occasion select pieces of sacred music will be performed on Wednesday and Thursday mornings. 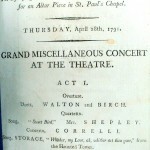 It is also in contemplation to have two Grand Miscellaneous Concerts at the Theatre in the evenings of the same days, and we are authorised to say that the committee, appointed to conduct this musical celebrity, are determined to spare neither pains nor expense to render it highly acceptable to the public. 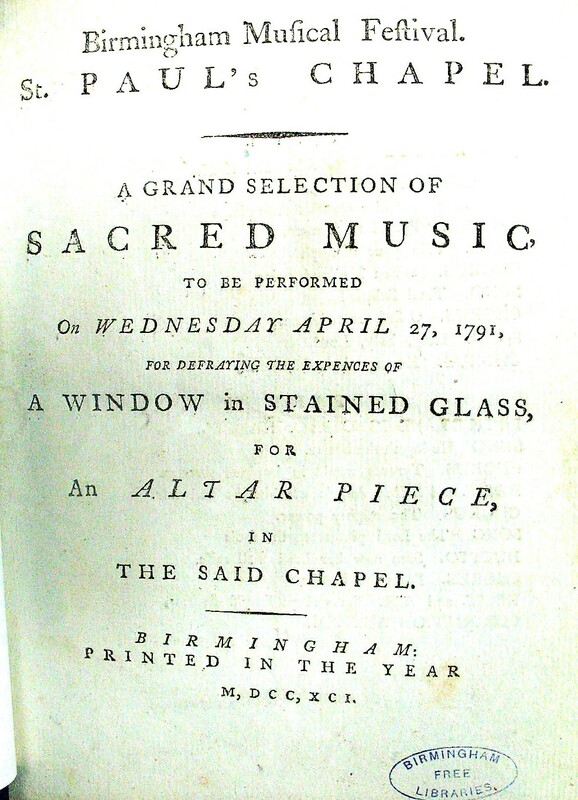 Amongst other principal vocal performers already engaged, are Signora Storace, Mrs Second and Mr Saville;……………..An organ, made by one of the most eminent builders, for the use of St Paul’s Chapel, will likewise be opened on the above festival” It almost begins to read like a festival to celebrate the window rather than to raise funds for it. Just a few weeks ago in Birmingham Archives I discovered what can best be described as an advertisement for the Festival in the weekly “Aris’s Birmingham Gazette” ( Issue No.2581 of Saturday April 23rd ) this date being just four days before the event was due to start. It is shown in Fig 3. 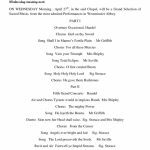 There is the full programme for a concert at St Paul’s Chapel on the Wednesday morning in Easter week, including some detail on Signora Storace’s participation, and apart from some small changes in order it is the same as in the concert programmes we had found earlier. It was Handel’s Messiah at St Paul’s Chapel on the Thursday morning. (The Messiah was a favourite for performances at St Phillip’s Church for other Musical Festivals.) 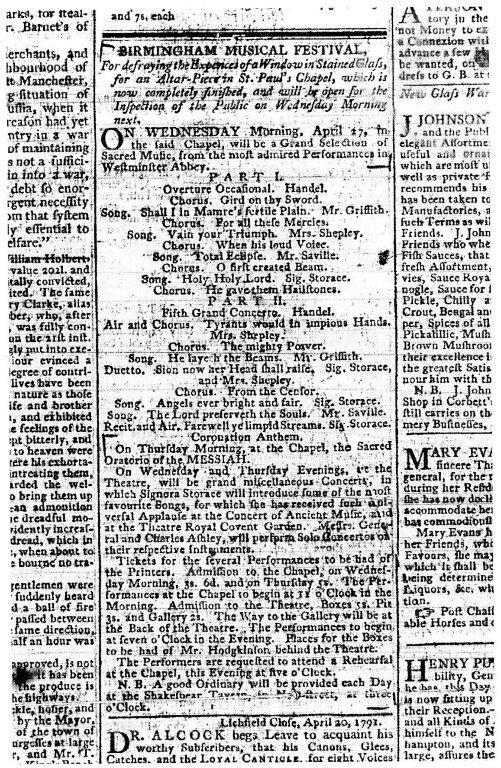 For the two evening concerts there are no details other than a comment that Signora Storace “…will introduce some of the most favourite Songs, for which she has received such universal applause at the Concert of Ancient Music and at the Theatre Royal Covent Garden” Note that at the bottom of the advertisement it was stated that a rehearsal was to start that evening at the Chapel. All a bit difficult if you did not read the weekly paper until the Sunday. 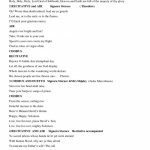 The songs Nancy sang in the two programmes we already had, have been brought together in Fig 4 and it is worthwhile elaborating on two songs at the Theatre. One is from “The Haunted Tower” and the other from “No Song No Supper”. As mentioned above Nancy had received “universal applause” at concerts. Emmanuelle Pesque has described her as a “very huge star—an instant hit with London audiences when she sang in the King’s Theatre, at the Handel Commemoration Concerts at Westminster Abbey and in the very exclusive ‘Concerts of Ancient Music’, concerts, oratorios, festivals etc.” Nancy’s brother Stephen was a composer and in 1789 he wrote the music for a Comic Opera at Drury Lane entitled “The Haunted Tower”. Nancy was hired by Drury Lane at £10/night and played one of the main roles. It was a Box Office sensation selling out for a total of 50 nights. This was followed by another Box Office sensation, the Comic Opera “No Song No Supper”. Birmingham really was getting the star singer of the day singing the star songs of the day! The painted window in St Paul’s Chapel may be seen at any Time by applying to Mr Cobbe, the clerk, near the sign of the Britannia St Paul’s-square. That must have been a shock. I have not seen any information on the finances of the festival nor on how the problem was settled. My view is that raising money for a Chapel’s debt is not exactly an attractive cause and such short notice of the Festival programme cannot have helped. The Birmingham Riots were just three months away in July, but there is no evidence of troubles beforehand that might have affected the size of the audiences. Emmanuelle Pesque’s own translation of what she wrote on p198 of her book includes “Amidst this alternation of opera productions in Drury Lane, the singer had many opportunities to appear in concerts. During Easter week, she even found time to go support a charity concert in Birmingham, to the benefit of a new stained-glass window for the St Paul Chapel.” So it being Easter week, was there a special reason for her participation in this festival? In the description of the joint 1778 Festival for the Hospital and St Paul’s, among the “Principal Instrument Performers” was the name Storacci. He was Nancy’s father, a Double Bass player regarded as “the first performer of his time” on this instrument. Was it because of this that Nancy came to Birmingham? Whatever the reason it remains that father played in a festival to help, in part, the building of St Paul’s Chapel and daughter sang in a festival hoping to help pay for the new window in St Paul’s Chapel. During the research for more information on this event a number of interesting connections were found. The artists involved in the window project were Benjamin West and Francis Eginton. While I was writing an article on the window for this web site I became quite interested in West and his works. I was quite taken with the comments by Ronald Russell in his book “Discovering Antique Prints” to the effect “ West was a prolific painter but a better businessman, aware that his work could only benefit from being engraved and that encouraging and working with the engravers was good policy” I think it highly likely that West was quite concerned about the situation Eginton was in. One of West’s engravers had been one John Hall some years earlier. Hall became a very significant figure in the Society of Artists and in reading about him it transpired that he was a godfather of Nancy and Stephen Storace. The Hall and Storace families would have known each other very well. So could there have been a West—Hall—Storace link that persuaded Nancy to take the offer? From the point of view of St Paul’s Church there is one final twist to all this. John Hall had two daughters and a son. They were Julia, Mary, and George. George became Master of Pembroke, Oxford in 1809. Mary married Stephen Storace. Stephen died in 1796, aged 34. In 1801 Mary married again, a Revd John Kennedy, a curate near Leicester, and a cousin of the Revd Rann Kennedy Then Julia married the Revd Rann Kennedy in Birmingham in 1803. A very learned man, from 1797 he had been a curate at St Paul’s Chapel and in 1807 became in addition the Second Master at King Edward’s School. In 1817 he became the incumbent at St Paul’s Chapel, a position he held until 1847. The Storace/Hall link has been explained, but what about Hall/Kennedy. George Hall was born in 1770 and went to Oxford. Rann Kennedy was born in 1772 and went to Cambridge. After graduating they both took Holy Orders. Did they overlap and meet? Is this the missing link? Footnote:- I am very grateful to Margaret Richards for help with this research. Figures 1, 2, and 3 are Reproduced by permission of the Library of Birmingham. I am very grateful to Emmanuelle Pesque for her observations on my original article. Thanks to her comments this is a new version, a more accurate account of that occasion in 1791. This entry was posted in St Paul’s History on May 21, 2018 by John Sawkill. I particularly like the idea of No Song No Supper. Might have to implement that.! Overall a very positive addition to womens history. I found your excellent article on Nancy Storace and the St. Paul Chapel today, and it enabled me to correct my typos and a faulty calculation of dates for these concerts. For the sake of completeness, I should add that there seems to be a problem with the rehearsal that took place on April 23rd: on the 25th, Nancy starred in Stephen Storace’s The Siege of Belgrade at Drury Lane Theatre, and it seems highly improbable that she went back and forth for this rehearsal. (There is no record of her having been replaced at Drury Lane on this night.) By the way, many rehearsals admitted paying audience. Maybe it was also the case here. It’s also interesting to note that on the 29th, a concert from the Salomon Haydn Series took place in London: for once, Storace didn’t sing in it. And on the 30th, she sang in Stephen Storace’s ‘The Haunted Tower’ at Drury Lane Theatre. The aria “Dove sei, amato bene” sung by Nancy Storace is probably one taken from Handel’s Rodelinda; she often sang it during Oratorio concerts. “Signora Storace singing her favourite songs” probably meant that she sang the “favourite songs” from her repertoire, that is Stephen Storace’s operas and her recurring arias from the oratorios. Nancy Storace’s participation to the Birmingham Music Festival doesn’t strike me as odd nor a “bit out of place”: she sang in many festivals during her whole British career, and I noticed that each time there is a gap in her London schedule, she squeezed concerts in, be it private or public, in London and other places… She often helped benefit concerts, so her being there isn’t that surprising. As for Stefano (or Stephen) Storace (“Storacci”)’s participation in the 1778 Birmingham Festival, he was probably earning some more money for his proposed trip in Italy: as a famous virtuoso he probably earned good money for it… (Note that all the instrumental performers who are listed in the ad for this festival were quite famous at the times…) In late 1778, Nancy and her parents were to go to Naples, in order to reunite with Stephen (junior) who was then studying at a Conservatorio. Nancy began her stage Italian career some months later in Florence and she also sang in Naples. The link between Storace and St. Paul was probably Rann Kennedy: I read somewhere (I don’t recall where exactly) that he was already associated with St. Paul’s before he became curate here. However your sentence “One of West’s engravers had been one John Hall some years earlier” opens another different angle… John Hall seems to have had a lot of acquaintances in the theatre world. I’d like to address some of your assessment of Nancy Storace’s career. You wrote: “Stephen was a composer, and he had had some tuition from Mozart”. It is partly right, as we have NO source corroborating that he really was Mozart’s pupil. He certainly met him, quoted him (he used some Mozart pieces in his pasticcios operas) and was probably influenced by Mozart’s music, but that’s about all. You wrote: “Then in 1789 Stephen wrote the music for a Comic Opera at Drury Lane entitled ‘The Haunted Tower’ with Nancy not employed by Drury Lane but in a Guest role. It was a Box Office sensation, selling out for 50 nights in succession.” On the contrary, Nancy Storace was hired by Drury Lane Theatre and she was paid £10 /night. She played a servant (disguised as a lady) in the opera, but she had one of the main roles: she was one half of the comic couple, the serious couple being sung by Michael Kelly (another Mozart creator) and Mrs (Anna Maria) Crouch. There were 56 nights of ‘The Haunted Tower’ during the season, which was enormous, but there weren’t successive nights: the operas or plays were usually alternating. Each night, there was a ‘main piece’ then an ‘afterpiece’. 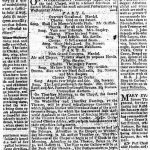 Going back to Birmingham, maybe you could shed some light on another sojourn Nancy Storace did in the city: she sang at the Birmingham Theatre in July 1797 for six nights, as her Benefit earnings show. They were mentioned on ‘The Monthly Mirror’ (August 1797 issue): “The London performers have done very well at their benefits here (…) Signora Storace, —- 135 [£]”. I have been unable to find any details about these opera performances, due to my inability to have access to the local newspapers for that period. Thank you again for a piece of fascinating local history. I have been very happy to see your photographs of St. Paul’s beautiful painted windows. Emmanuelle Pesqué, author of ‘Nancy Storace, muse de Mozart et de Haydn’. PS: I couldn’t post this comment in one part.